Creating a separate vanity space can make your bathroom feel more spa like. Your bathroom is one of your most personal spaces, so why not let yourself indulge? By transforming your bathroom into something that is tailor made for self-pampering, you can make a trip to the spa without ever leaving the sanctity of your home. 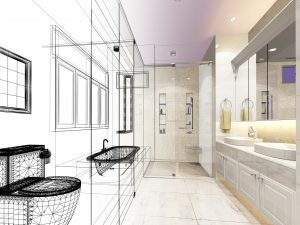 Here are a few features you can add to make your bathroom feel more like a spa. Modern showers can include many different therapeutic features, from body sprays to multiple shower heads and infinity drains. If a good soak is how you like to unwind, a tub with heated air jets is a great way to replicate the spa-like experience of a jacuzzi. Consider placing tubs in a position where they’re less likely to take up valuable square footage. Stepping on warm tile floor is one of most luxurious feelings, especially during the dead of winter. You can have heat placed below tiles at relatively little expense. A radiant floor heating system provides smooth, even heat unlike forced air furnaces of HVAC unit. Radiant heat mats are another alternative for heating specific areas in your bathroom. You might also consider heated towel racks or a warming drawer for linens. More privacy is one of the best ways to make your bathroom feel more spa like. Hide away the loo behind closed doors to give your master bath a little more privacy. Having a dedicated vanity with storage will give your bathroom more space for countertops, which can matter a lot for couples that are constantly fighting to control the sink. Speaking of sinks–undermount sinks present a sleek look while making countertop cleanup easy. You can completely change the energy of your bathroom with simple adjustments to lighting. Add a light dimmer or scented candles around the perimeter for a softer ambience. Proper lighting for your mirror is important so you can see the best of yourself. Lights mounted at eye level on either side of your primary mirror will provide shadowless illumination. Consider expanding windows and skylights to let natural light into your bathroom. Ready to get started on your next kitchen or bath remodeling project? Kitchen and Bath Depot is your premier home remodeling professional. We provide remodeling services to customers throughout Maryland, Washington D.C., Bethesda, Chevy Chase, Rockville, Potomac, Silver Spring, Olney, Gaithersburg, Derwood and North Potomac. We’re here to talk whenever you’re ready, so get in touch with us at 301-942-8092 or check out our showroom at 11637 Boiling Brook Parkway Rockville, MD. You can also read up on our latest testimonials or connect with us on Facebook, Twitter, Google+ and Pinterest. This entry was posted on Friday, September 23rd, 2016 at 2:11 pm. Both comments and pings are currently closed.